The tough talking incoming president Rodrigo Duterte plans to eliminate the networks of illegal drug in the country in just 3-to-6 months. That's why he started to clean the Philippine National Police and so with those thirty five local executives who are allegedly part of illegal drug networks. According to Quezon Rep. Danilo Suarez, "Parang binibigyan nya ng leeway ngayon na confess. Siguro lighter sentence dahil nagconfess ka na pero he is not saying clemency or pardon," as he told to ABS-CBN News. The president-elect Rodrigo Duterte mentioned the names of those 35 local leaders to Rep. Suarez. And told that he will ask these elected officials who are also drug offenders to vacate their posts immediately. But Suarez declined to name them and just give a hint that these could be mayors or governors. Duterte also told to them that he aim to clean the ranks of the Philippine National Police as some of its members have been ensnare into the illegal drug industry. Suarez said, "He even mentioned that he might need the support of the Armed Forces in the cleansing method, eliminating those men in uniform who are involved in this drug issue." On the other hand, Duterte also warns those three 'corrupt' Philippine National Police (PNP) officials, he advised those 3 'corrupt' PNP officials to resign or he will humiliate them on public. Duterte said, "Corruption must stop. I would have to ask about three generals diyan sa (Camp) Crame to resign. Do not wait for me to name you in public because I will only humiliate you." Do you agree with President-elect Rodrigo Duterte? Please share your thoughts below. 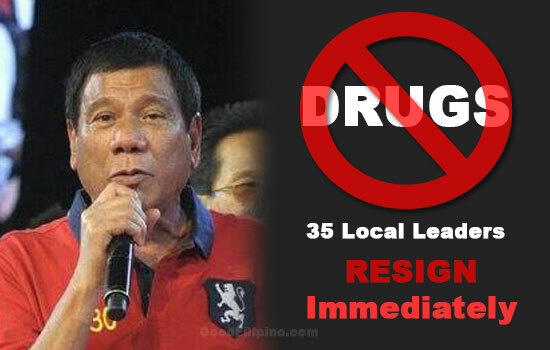 Comments or suggestions about "Duterte to 35 local leaders involved in illegal drugs: 'Resign Immediately'" is important to us, you may share it by using the comment box below.